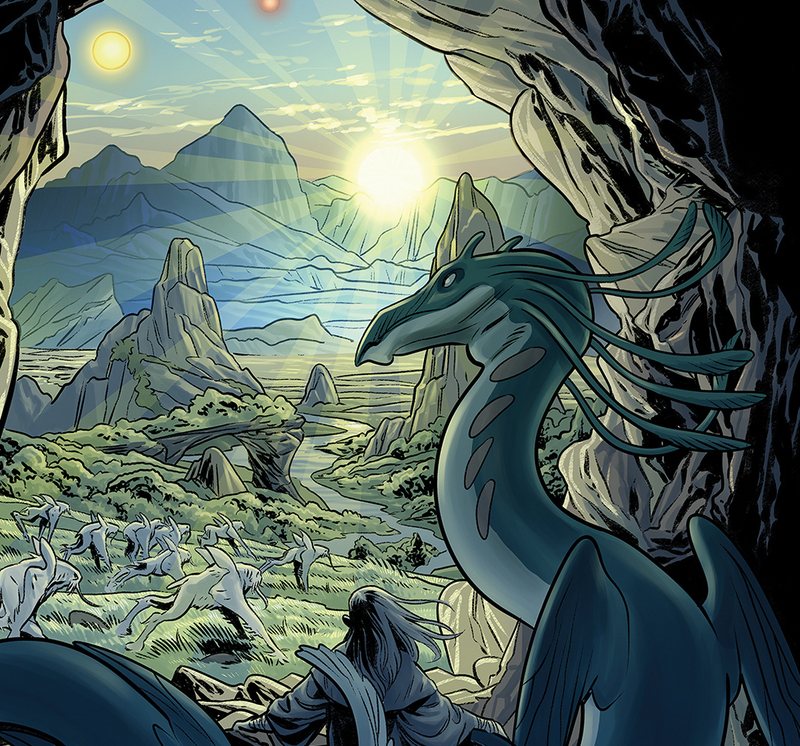 Jim Henson's Beneath The Dark Crystal #4 Review – AiPT! A must-have for anyone collecting this series for its story resolutions and set up. Jim Henson’s Beneath The Dark Crystal #4 hits comic book store shelves this week and continues the story of two worlds, one above and one below. Above in the world of Thra, Kensho and Toolah sneak into Dagger’s Root prison to retrieve a gem taken from them by Trunk and also to confront the song teller Dihnmor, who sold them out to Trunk and was imprisoned there. Once inside, they discover many innocent victims of Trunk and Branch being held captive like animals and decide to rescue them all. Meanwhile below in Mithra, Thurma and Nita continue on their quest to build the Crystal Castle and determine who is to rule Mithra and who is to be banished forever. First, however, they have agreed to help the fire angler Glasme rid her hollow of an ancient darkness plaguing it. The three Firelings find themselves face to face with a giant beast known as the Fragor who has the ability to render its victims temporarily deaf with its songs. Back in Dagger’s Root prison, our two Gelfling heroes manage to free the prisoners, but not without waking Branch. He calls out to the other guards as Kensho tries to subdue him and allow the rest time to escape. Kensho is unsuccessful and is overpowered by Trunk and taken prisoner. This issue ends with an epic battle between the monstrous Fragor and the three Firelings. While Thurma and Nita are disoriented by the beast’s songs, Glasme charges it to protect Thruma and is struck down. Suddenly a crystal blade punches up through the creature piercing and killing it. The Fireling’s savior then appears to them and reveals that it is the Fire That Stays who Glasme told them to seek out to learn the ways of the fire anglers and build the Crystal Castle. This is a good installment in this 12 part mini-series for the most part. It does feel a bit disjointed in its transitions back and forth between events in Mithra and the events in Thra; however, this is more in the layout of the book itself and not in its actual story. Adam Smith’s writing is wonderful as always and he does a great job finding resolution with certain scenarios, while also setting up the next issue for even more drama and surprises. The relationship between Kensho and Toolah in particular is very entertaining and there is a genuine sense that they are growing closer through this journey together. Smith also shows the reader that although Thurma and Nita are trying to defeat each other for the crown, they also both have the best interests of their worlds in mind, just from two different perspectives. The two must work together to build a new Crystal Castle for the greater good of all of the people of Mithra. Alexandria Huntington’s artwork on this series continues to be beautiful and whimsical. Some of the action sequences in this issue however are not on par with the previous issues. The book overall still looks great, but the whole battle with the Fragor feels muddy. It was hard to understand what exactly happened to Glasme during the battle, and I found myself having to focus more on the clothing of the three Firelings at times just to be able to determine who was who in the fray. The bright vibrant reds yellows and oranges look beautiful, but also manage to wash out a lot of the details of the action. In spite of this, it is still a brilliant looking book, drawn and colored masterfully. It just took a bit of the impact out of the climactic ending to have to look the pages over a couple of times to figure out exactly what was going on. Overall this issue is a good installment in the series with only a few minor issues that keep it from being great. I would recommend this to anyone collecting the title thus far because it does contains some important resolution and setup that is necessary for the story. This is a good issue that manages to fall a little short in comparison to the previous issues. It is however action-packed and does show a decent amount of character development in spite of a few flaws. The washed out colors sometimes muddy up the otherwise exciting action sequences.